Warning – I’ve read a lot of books lately! Which means I have a lot of books to share today! I’m linking up with Jana and Steph for Show Us Your Books as well! 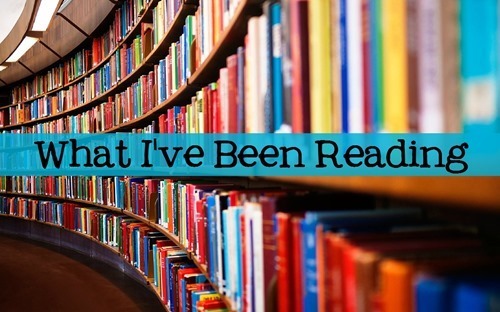 This month, I went to the library and started looking for books on my To Be Read list. I found a bunch of them and got started! First up, I read The Weekenders by Mary Kay Andrews. May I just say that I feel like I read this so long ago that I barely remember it? I guess it wasn’t memorable…not that it was a bad book or anything! This book reminded me of another book I read recently, How To Keep A Secret by Sarah Morgan, in that there was a family thrust together in a similar way, on an island, with a teenage daughter. In both, the husbands were up to something suspicious as well. I think How To Keep A Secret was better, with more character development, and more likeable characters overall, but The Weekenders does have an interesting family to read and learn about as well. Next, I read Something In The Water by Catherine Steadman. I had put this on hold at the library when I saw it reviewed by another blogger. I guess it has a long wait because it was recommended by Reese Witherspoon, but I didn’t find it all that compelling. Throughout the book, I kept wondering whether there was a point to the whole thing. This book also reminded me of a book I read previously, The Flight Attendant by Chris Bohjalian, because both featured characters who couldn’t seem to stop themselves from getting involved in things they shouldn’t. “If you could make one simple choice that would change your life forever, would you? Suddenly the newlyweds must make a dangerous choice: to speak out or to protect their secret. After all, if no one else knows, who would be hurt? Their decision will trigger a devastating chain of events. . .
You Will Know Me by Megan Abbott had been on my list for awhile, long enough that I don’t remember why it was there in the first place, other than someone else must have said it was good. This book was a mystery taking place in the world of competitive gymnastics, which was a new and interesting setting for me, and I felt that it was well-written in a lyrical sort of way. The author did a good job at making competitive gymnastics sound like a very scary sport to participate in, with injuries and difficult loses, as well as the push for perfection that seemed to be quite hurtful to those involved. One of the more intriguing characters for me was Devon’s younger brother, who lives in her shadow and did what he could to help the family. It may have been interesting to get more than just one character’s voice throughout the story, but overall I thought this was a good read. One Perfect Lie by Lisa Scottoline wasn’t on my list, but because she is an author I like, I have been reading a few more of her books. There was a bit of a major twist in the first part of this book and after that, it plodded along until the unrealistic ending. As far as an easy, quick read, this definitely qualifies. The boys and their moms were pretty interesting and I liked finding out more about each of them. The conclusion as far as the mystery goes seemed a little out of the blue. I think the author likes to lead her readers in the wrong direction to figure out what is happening, but she goes a little far in not giving any clues towards the right one! Next I read One True Loves by Taylor Jenkins Reid. I had a lot of time and I finished it over two days. I did find it entertaining and a good story. You feel for the main character and her difficult choice, although I think the author did a good job expressing why she had to do what she did in the end. “In her twenties, Emma Blair marries her high school sweetheart, Jesse. They build a life for themselves, far away from the expectations of their parents and the people of their hometown in Massachusetts. They travel the world together, living life to the fullest and seizing every opportunity for adventure. The book goes back into the past and describes Emma’s life from the time she was young until her marriage to Jesse and beyond. You really get a picture of the type of person she was and who she is now. Both men were perfect for Emma and while it may be easy to say she chose wrongly, I was also able to tell why she chose who she chose and to say it was the right choice for her. In a very different direction, The Light of the Fireflies by Paul Pen was another book that made me think and wonder what I would do in the situation the characters found themselves in. This book is about a family who has been through tragedy. The way the story is told makes it hard to know who to empathize with and who to trust, and I found the reveal to be very sad and even disturbing. One thing I didn’t like about the book is that the characters don’t have names. It made me wonder the author’s reason for not providing them with names. One reviewer wrote that it was done to avoid anyone assigning the characters characteristics they did not have based on their names alone. Another says that it was because this shows that the things that happened to this family could happen to any family. It’s quite scary to imagine a family like this existing, and yet I’m sure there are things that happen in families that are thousands of times worse than the things that happened to this one. While this book is upsetting, it focuses on the things you do to protect your family. It definitely makes you think about the things you might have done differently. Finally, I read Never Let You Go by Chevy Stevens. I have had this book on my list for awhile and while I’ve read other books by Stevens, I didn’t get to this one until now. It was a fast and suspenseful read in which I thought I knew who to suspect and then questioned whether I was correct. The beginning of the book flashes back to Lindsey’s marriage to Andrew and you understand how he treated her and how awful he was to her. When similar things start happening to her again in the present, of course Lindsey thinks Andrew is stalking her. There are several other characters who can be suspected and many of them do things that make you wonder, including Lindsey’s own daughter. There is a twist that surprised me and made everything clear with a suspenseful conclusion. I think of all the books above, I enjoyed this one the most!